Two Duke engineering faculty have been named as the inaugural recipients of the Edmund T. Pratt, Jr. Professorships. Guillermo Sapiro was formally named the Edmund T. Pratt, Jr. Professor of Electrical and Computer Engineering and Omar Knio as the Edmund T. Pratt, Jr. Professor of Mechanical Engineering at an investiture ceremony held on April 19, 2013. The ceremony also honored biomedical engineering professor Kam Leong for being elected as a member of the National Academy of Engineering earlier this year. The new professorships, made possible through the gift of anonymous donors, recognize the namesake of the Edmund T. Pratt, Jr. School of Engineering at Duke. Katsouleas noted that the endowed professorship played a key role in the successful recruitment last year of Knio, “our unanimous top choice” for his position. A leader in the fields of uncertainty and optimization, Knio came to Duke from Johns Hopkins University, where he was professor of mechanical engineering. His research focuses on computational fluid mechanics, oceanic and atmospheric flows, turbulent flow, physical acoustics, chemically-reactive flow, energetic materials, microfluidic devices, dynamical systems, numerical methods, and asymptotic and stochastic techniques. He is now director of risk assessment and uncertainty and co-director of the Center for Materials Genomics at Duke. “Duke has been a great family to me,” said Sapiro, who holds secondary appointments in the departments of biomedical engineering and computer science. 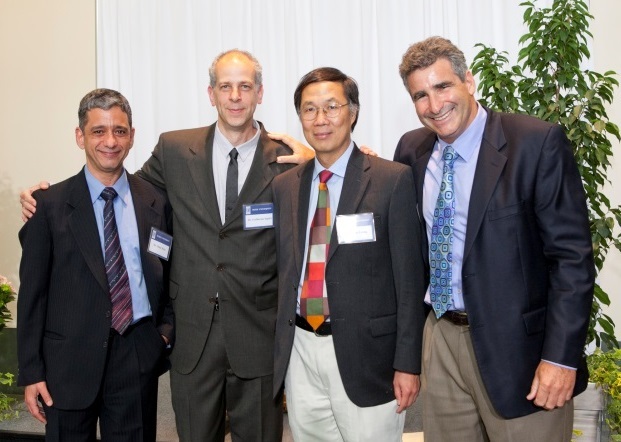 The recipient of major awards including the Presidential Early Career Awards for Scientist and Engineers (PECASE) in 1998, the National Science Foundation Career Award in 1999, and the National Security Science and Engineering Faculty Fellowship in 2010, Sapiro is also the founding editor-in-chief of the SIAM Journal on Imaging Sciences, currently ranked second in impact factor in all applied math. His research focuses on developing image-processing algorithms that interpret vast amounts of data from photos or video and translate the findings into practical solutions, from medical breakthroughs to new surveillance methods to improvements in consumer products such as Adobe’s After Effects software.